Retrieve domain authority, page authority, external equity links, and more for a list of URLs from MOZ. If you have a larger list of URLs in Google Sheets, this is a great template to enrich those URLs with metrics. 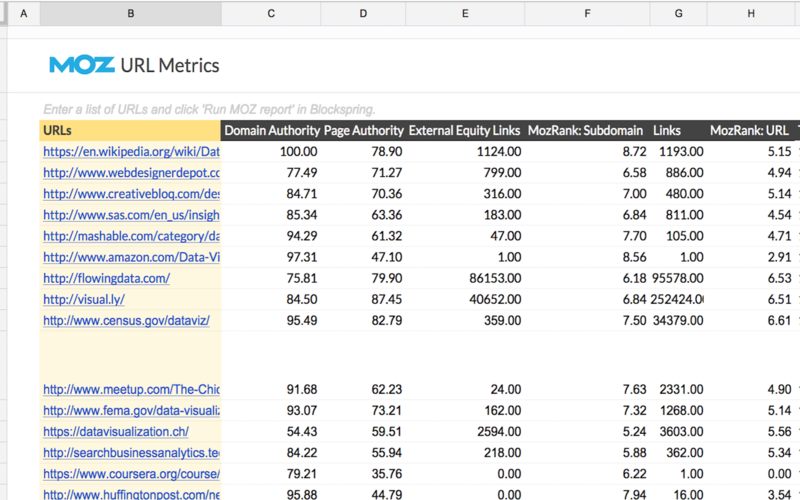 With each run of the template you should be able to fetch metrics for about 300 URLs due to Google Sheets and MOZ restrictions. If you have a premium MOZ API account, you'll be able to enrich thousands at a time. Chat us below or email support@blockspring.com and we'll get you started!